Scott Jeffery and Mitch Le Fevre were honoured in a roll call of Tasmanian football champions on Saturday night in Hobart’s, Wrest Point Casino. Scott Jeffery was elevated to Legend status (a first for a Tasmanian umpire) and Mitch Le Fevre was inducted into the Tasmanian Football Hall of Fame. We offer our heartiest congratulations to them both. See a more detailed article about the night later in the week. 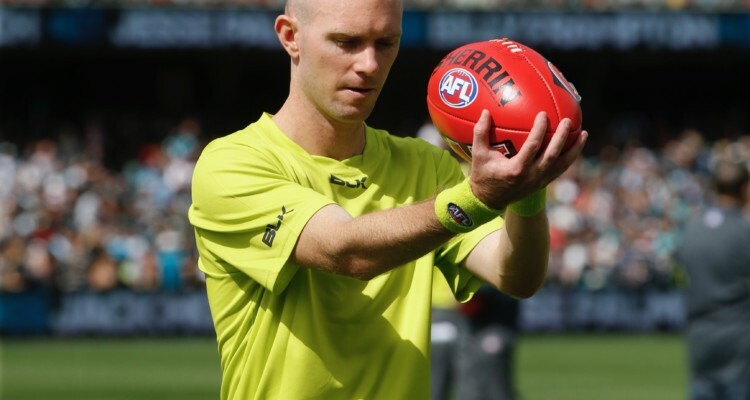 Congratulations also goes to former grand final boundary umpire, Chris Bull for his 150th game milestone on Friday night in the Port Adelaide v Melbourne clash. Coming off the 2016 grand final, Chris had a frustrating 2017 season with niggling injuries and only managed 17 matches. Now fully fit Chris already has 11 games under his belt this season and is back to his very best. Justin Schmitt and Andrew continue their comeback from injury. Both umpired in the VFL on the weekend with Eleni Glouftsis. The final week of the four umpire trial has been completed. 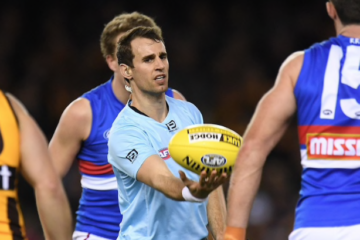 The umpiring department will complete its analysis and the AFL will continue to examine ways to improve the look and feel of the game. I find it interesting that free kicks went up by 6 per game during the trial and even more interestingly up by one inside forward 50. Does that mean umpires were over officious or simply in a better position and not under physical pressure to make the right calls. As we continually say the free kick is a good one if it is correct. The injury list is now down to two with Scott Jeffery the only umpire not to have graced a ground this season. While Luke Farmer has had a couple of 15 minute stints in practice matches. Congratulations also goes to former field umpire, Tristan Burgess. Tristan umpired his 175th VFL senior match on Saturday at one of his favourite venues, Etihad Stadium. That match means that Tristan becomes a life member of the VFL. Tristan umpired 30 AFL matched between 2012 and 2014. 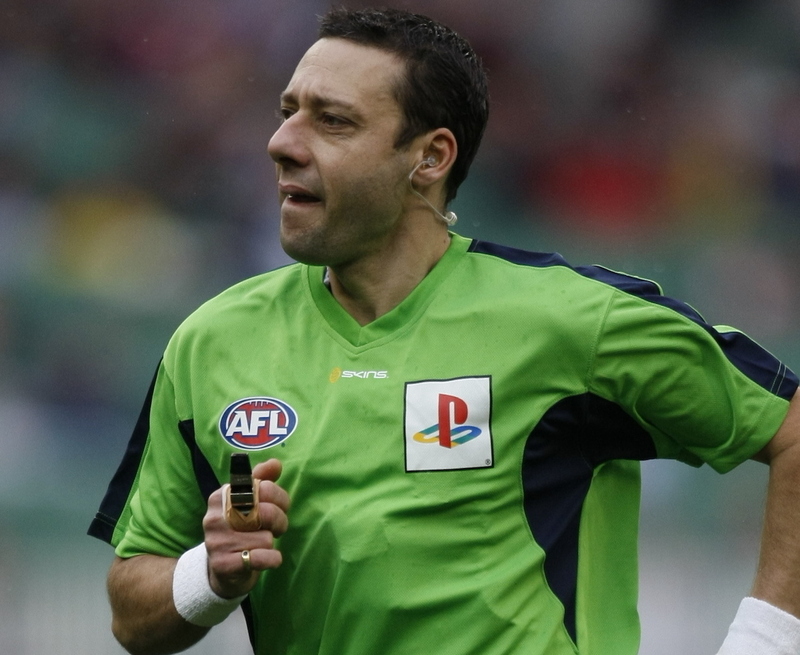 He was one of the few umpires to return to the VFL because he just loves his sport. Talking about an umpire who loves his sport, Brett Rosebury broke a long standing record in the WANFLUA (the West Australian umpires association) this weekend. He umpired his 452nd game (AFL/WAFL) combined breaking former AFL/WAFL boundary umpire, Greg Smith’s record of 451. Greg umpired 159 AFL games including 2 finals between 1996 and 2005. Brett has umpired 67 WAFL games and 385 AFL matches in his career to date. Both men are inspirational to our current umpires. SANFL goal umpire Steve Murphy is another former AFL goal umpire who brought up a milestone last weekend. Steve umpired his 300th SANFL match. Steve also umpired AFL football between 1995 and 2005 umpiring 74 games including one final. Steve you’d all agree is an evergreen who like Greg Smith (WA), Tristan Burgess (VFL) are salt of the earth people who never seem to age and just keep performing to the required level day in and day out. Thursday night football continues this week despite returning to a full round of 9 matches. The rotations are over, the mini break is behind us, the grind of June/July continues as the run into the finals intensifies. See you all at the footy.